It is the perfect weather to slip into your flip flops or your favorite sandals to wear with your summer dress. In order to give your entire outfit a notch up you can add ankle wrap around your shoes which will add extra flair and glamour. This is an easy to do project which require little time and effort. Here is a couple of ways you can make your very own ankle wrap shoes. For all of the below ways, you will need a pair of heeled shoes that either has a strap or back around the ankle. You will also need ribbons or any light weight fabric whose color is very close to the color of your heels. 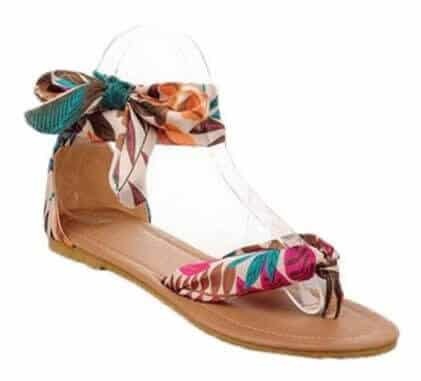 You will be surprised to see your regular flip flops looking chic after adding the ankle wrap around it. You will need colorful and patterned chiffon that is cut in 1.5-2 inches wide. The length of the chiffon depends on how big and grand you want the bow to be at the end. Now comes the easy part where you just cover the straps of your flip flop entirely without missing any spot. Make sure to leave enough length on both the ends to help you wrap it around your ankle and tie a neat bow. to look fashionable and trendy.